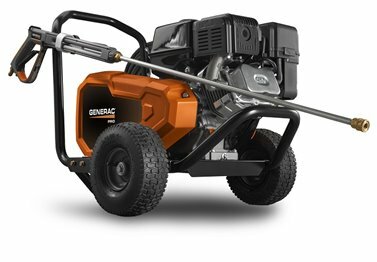 Introducing our Belt Driven Pressure Washer from Generac PRO. With a triplex belt-drive pump, Generac G-Force Engine, triplex ceramic-coated pistons, and compact design, you’ve never seen a more durable washer. The heavy-duty belt drive triplex pump lasts three times as long as direct drive pumps. This ensures the unit a reliable choice for whenever you need to pressure wash. This power washer is up to 50 pounds lighter than comparable pressure washers are without sacrificing durability. The easy-to-pull trigger on the spray gun is ideal for longer jobs. This unit was designed for reduced fatigue and optimal comfort. Pressure Control Valve- Easily adjusts to just the right amount of pressure needed. Oversized Pneumatic Wheels- Can take on any type of terrain with ease. Steel Reinforced Hose- Never worry about leaks or difficulty connecting to the unit.